A new class of naval vessels customised for emergency aid could hold vital lessons for the world, starting with Britain. 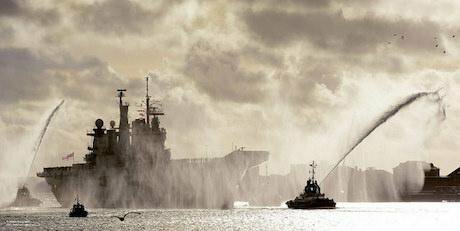 HMS Illustrious Returning to Portsmouth, 2014. Flickr/Defence Images. Some rights reserved.One of the most contested areas in the international arms market is the propulsion contract, especially for naval warships. Two of the biggest companies in the field, historically American and British, are GE and Rolls-Royce. In March 2016, GE won a major contract to supply its LM-2500+G4 gas turbines to seven new multi-purpose vessels (known as the PPA vessels) for the Italian navy, themselves part of a large shipbuilding programme designed to upgrade a seriously ageing fleet. Not perhaps the best news for Rolls-Royce, given that the PPAs are quite substantial ships – the size of frigates. But the company was more than compensated by the Italians' decision to award it the contract to supply the MT-30 engine for the navy's large new amphibious-warfare ship, a helicopter landing dock (known as an LHD). This is also a large vessel, coming in at 27,000 tons displacement – indeed under some loading conditions it could rate at over 30,000 tons, making it the Italian navy’s largest warship. So far this all seems routine: one more example of a lucrative arms trade where a handful of big companies dominates the order book of the more wealthy armed states. That is certainly true, and all power to groups like Campaign Against Arms Trade (CAAT) that have done so much to open up a thoroughly murky and often bribe-ridden process. Even so, this particular shipbuilding programme is rather different to the norm and has some interesting lessons for attitudes to security. These lessons might be learned to good effect by the Labour Party in Britain as it seeks to carve a new defence agenda. At root, the new warships are just that – warships plain and simple, with a wide array of weapons systems and sensors. But the clue lies in the term "multi-purpose", which applies as much to the LHD as to the smaller vessels. From the keel up, they are designed for two parallel roles: to act as warships, but also to act in a wide range of humanitarian roles. The LHD, for example, will have far larger hospital facilities than its size and usual function would dictate. There will be a desalination plant that can cater for 6,000 people, though the crew will be just 450. And the ship will routinely carry a number of standard containers fitted with a wide range of disaster-relief gear. Alongside this large ship, the much smaller PPA multi-purpose vessels will also normally have a wide range of equipment and supplies for disaster relief and other humanitarian missions. In addition, it is anticipated that the navy’s training and education organisation will be modified to produce sailors with a wider range of skills and knowledge. There is no lack of problems with the idea. Much traditional naval thinking just cannot accept that "military" and "civil" ingredients can mix. In this view, a warship might provide some aid in an emergency, for example after an earthquake or typhoon – but only as an “add-on” to its primary function, which must always be war-fighting. From another angle, critics point out that it's possible to build several car-ferry-sized ships for the cost of a single LHD, and just have them ready for an emergency or even lease them as required. Many non-government organisations, including those involved in relief operations, are cautious about the military being involved in civil action; several express or refer to deep suspicions of what could be seen as a stepping-stone to western military intervention; yet others say that this kind of project should only be developed as a true multinational endeavour under the United Nations, with the emphasis on the humanitarian element and the only “warship” aspect required being one of self-protection. All these views are relevant, but a core underlying argument also needs to be considered. The big picture shows that the world is moving into a period of much greater security problems stemming from climate change and severe economic marginalisation. Even if serious efforts are eventually made to confront and control the underlying reasons for the problems, there is every chance of hugely serious humanitarian emergencies in the coming decades (see "Migration, climate, and security: the choice", 3 September 2015). Is it possible, therefore, that developing these multi-purpose responses might just help wean the world's militaries off their deeply embedded emphasis on armed actions to the exclusion of other kinds. There are no easy answers here. But what is intriguing is the relevance of this argument to one country, Britain, and one seriously divided political movement, the Labour Party. One of the biggest disagreements in that party is over the question of whether to spend well over £100 billion over the next half century on maintaining a robust nuclear force, beginning with the upgrade of the Trident-centred nuclear-weapons system. The real issue here, however, is about the status that such capability provides. There is a deep assumption that continuing to have nuclear weapons will be a ticket to the “big boys’ club”, and that a self-respecting “big boy” such as Britain must hang on to its ticket for dear life (see "Britain's deep-sea defence: out of time", 3 March 2016). But consider another case. 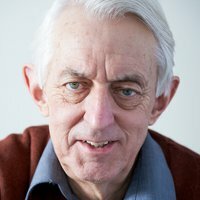 Suppose nuclear weapons are far less a proof of status than a means of being able to play a sustained and effective role in addressing the many new security challenges that are going to face the country and the world – challenges for which nuclear weapons may well be irrelevant? Then, just suppose that the latter “status” begins to derive much more from being able to respond effectively to many different kinds of emergencies, and that the means to do so include the new kinds of naval platform that the Italians are now focused on building. Perhaps this could in turn contribute to some kind of United Nations standing force, such as the proposed UN Emergency Peace Service. Could the Labour Party be at the forefront of this argument, and in the process shed its 60-plus-year love-affair with nuclear weapons? Perhaps not – but with Jeremy Corbyn around, interesting things are possible.